I remember back in College I foolishly decided to dive into a generative design studio. I set out to use grasshopper for the first time. It was magical. I created a point with three inputs, a second point with three more inputs, and then I connected the two points with a line node. The total effort? 9 nodes, 1 line, 30 minutes, three online tutorials, and one tall coffee. Our March update is now live! Our January update is now live! Simply launch Residential Engine and it will update. As a skilled CAD draftsman, hand-drafting is painfully slow, and as a BIM modeler, CAD is painfully slow, but what makes BIM painfully slow? It is an interesting thought experiment. What is the typical process for site selection? Typically it is a very bottom-up approach. Talking to brokers, driving around looking, or hearing about one at a happy hour. With the power of public records and massive amounts of data, we can look to software for a different route. Designers do thousands of iterations. Why? Well, the next iteration of a design will be better than the last. Right? This is normally the case, but sometimes an iteration is a failure (most of them are). How does one decide if it is a good iteration or not? I was green, fresh out of college, and had just planned my first building. My boss simply asked, "What is the efficiency of this building"? I had no idea. "Let me check...Ill get that to you as soon as possible"
This is the 3D and Amenity update. The pro-forma calls for X units in order to make a project viable. This makes X, or better, the target to achieve for a density study. There are several levers to pull, but each lever has an impact on an overall design. 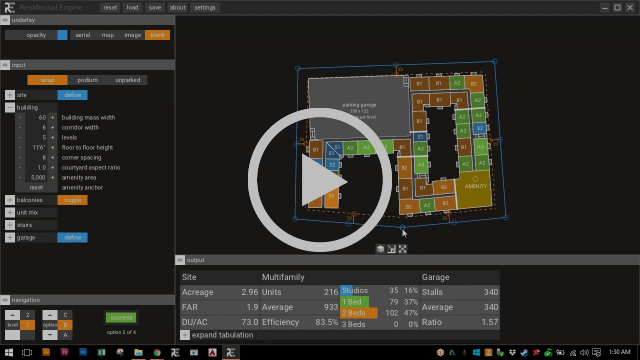 To demonstrate these different concepts, I am using TestFit, a parametric multifamily modeling tool on a theoretical site. Any modeling tool will suffice for these levers, and should work with pencil on trace, CAD, or any other kind of workflow.